The first disposable cups were developed in the United States in the early 20th century to defeat epidemics due to the communal use of ladles and cups in public places where drinking water was served or in drums on trains. 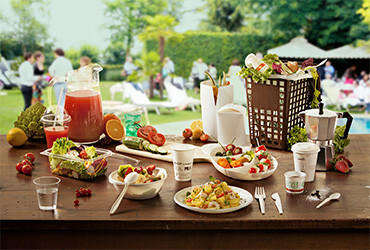 Over a century, the use of disposable paper and plastic cups and cutlery has become popular in a wide number of occasions and has dramatically changed the way people eat and drink in public events, such as food festivals, shows, concerts, fairs, canteens. 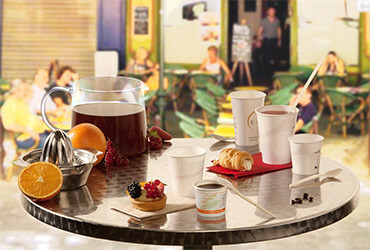 Cardboard cups are an ideal and functional solution for hot and cold drinks. Made of pure cellulose cardboard and internally lined with Mater-Bi®, they do not leak and are fit for contact with food. As well as being biodegradable and compostable according to EN 13432, they are made of FSC-certified paper, which means the materials come from eco-sustainably managed forests. They may be used in vending machines as well. This kind of transparent cups looks just like traditional plastics, the only difference being that they are entirely biodegradable and compostable according to EN 13432, as they are made of PLA, i.e. polylactic acid derived from a natural sugar that can be found in corn. Ideal for cold drinks, they can withstand a max temperature of 45°C above zero and 45°C below zero, and may be used in refrigerators and freezers. 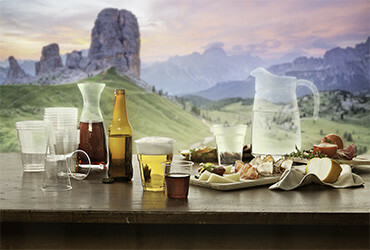 Available in many sizes to serve beer, soft drinks, cocktails, water, wine, etc.